It is believed that various forms of arts worshipping goddess Bhadrakaali prevailed much before the origin of temples. Once the worship of gods and goddesses started at the temples, various types of arts used to be performed to please goddess Bhadrakaali at Bhadrakaali temples. By and large, many of them were ruined while others continued to be performed systematically and in a more dramatic manner. "Mudiyettu" is one among them, a mixture of entertainment and devotion. The period of origin of Mudiyettu is un-traceable. This art is more of a ritual than dramatic. "Theeyaattu" is another ritual performed in Bhadrakaali temples. Mudiyettu is the story of the war of Bhadrakaali with the two notorious Asuras Daarikan and Daanavendran, eventually Killing them, while in Theeyaattu, Bhadrakaali reports to Lord Paramasiva after the assassination and briefs the whole incident. Mudiyettu, compared to other forms of temple arts, is presented without much of `mudras', facemasks and facial expressions, but with facial make-ups and `chutti' (artwork done on face with rice paste) which makes the characters simple and more acceptable to the viewers. Originally these characters used to perform with speech and dance, but later on rhythmic steps were introduced which gives more life to the characters and makes the performance more interesting. Mudiyettu is a ritual art where viewers also participate in the performance. Once the artists get separated, ie, since they `come to the light', the scene becomes more dramatic. It can be inferred that the character `Kooli' in Mudiyettu is the first of its kind to amuse the viewers by comic speech and action. This done in the morning, usually after the morning poojas in the temple. This is how the performance on that particular day is announced. The instruments used are `Chenda' (High-pitch drum), `Veekkan' (Low-pitch drum) and `Elathaalam' (Two round heavy brass cymbals with flexible string handles in the center). This is usually done in the afternoon. A colourful and artistic portrait of Bhadrakaali is made on the floor about the size of 5 meters X 3 meters. It is assumed to be how Naarada Maharshi demonstrated the should-be figure of Bhadrakaali to Lord Paramasiva. Natural pigments in powder form are used for this purpose. These are burnt husk of paddy (black), rice powder (white), dried and powdered leaves of `Vaaka'- Acacia (green), turmeric powder (yellow) and a mixture of turmeric powder and quick lime (red). Devotional songs in praise of Bhadrakaali are sung by the main artist in front of the `Kalam' after the night poojas in the temple. Bhadrakaali is extolled here in all her ferocity. After the song, the `Kalam' is wiped off by the main artist assuming the character of Bhadrakaali is fully absorbed in to him. After `Kalam maayikkal' (wiping off of the portrait) the artists undergo `chutti kuthal'. 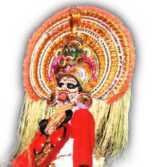 Other make-ups resemble that in Kathakali including head gears. Once the `chutti kuthal' is over, a big oil lamp (similar to `Kathakali vilakku) is lighted in the centre of the temple yard. The performance is carried out centralising this `Arangu vilakku'. This is to announce the starting of the performance. The thaalam (rhythm) used here is `Kuntanaachi', a mixture of `Atantha' and `Champa' thaalams. The story of Mudiyettu goes like this: Daarika and Daanavendra were two notorious Asuras, born to Daarumathi and Daanamathi. In order to achieve more powers, they performed severe penance and Lord Brahma was finally forced to appear before them. They demanded the boon for immortality, but Lord Brahma declined this request as death was inevitable for anybody once taken birth. The Asura brothers then compromised with the boon that no males can ever kill them. Lord Brahma then asked them why they did not demand that females also could not kill them. The asuras enraged by the pride of the boon they got, retorted "It is a disgrace to us and our community to demand likewise.How how dare a female kill us as long as we are strong enough for anyone to harm us?". Annoyed by the pride of these Asuras and sensing their evil intentions, Lord Brahma curses them-"Let you be killed by a female". This part of the story is not performed in Mudiyettu. Following are the sequence of scenes presented. 1. Kaali, after Kooli Purappadu but before Koodiyattam, takes infants among the viewers to the Arangu Vilakku, rotates the child around it thrice, and offers Prasaadam (flower from the garland on the head gear). This rite is supposed to immunise the child from contagious diseases (especially small pox), a long healthy life and to help the child to drive away all unwanted fear in mind. Cotton torches are an unavoidable part of the ritual during the Purappadus as well as the battle. Dried and powdered resin of pine wood (`Thelli') is thrown on to the flame of the cotton torch which inflates highly and adds to the seriousness of the scene. Further, this has proven medical values as the smoke emitted cleans and refreshes the atmosphere and destroys harmful elements which cause contagious diseases. After Killing the Asuras, Kaali performs a pooja in front of the Arangu Vilakku worshipping Lord Siva. The cotton torch used on this occasion is is then taken amidst the viewers, `Thelli' is thrown on its flame and the viewers inhale the smoke which is considered to be the most auspicious act of this ritual. Mudiyettu may well be considered older than all other existing theatre forms of our country. It is definitely older than Koodiyattam, as the dramatic concept is much cruder and folklorish. Moreover, it belongs to the period when worship was conducted in "Kavu" (grove), for temples were yet unknown in these parts of the country. Worship of nature as mother was a salient feature of our culture and no wonder this is evident in most of our ritualistic art forms. There are few distinguishing features of Mudiyettu, which highlight its ritualistic nature. The absence of a restricted and designated stage ensures the viewers' involvement, which is an essential aspect of Mudiyettu. The near total absence of Hasthamudras (Hand gestures) perhaps the most important element of acting in Kathakali, Koodiyattam and the like is a clue to its ancestry. The theme of the performance is the well known story of the incarnation of Bhadrakali as the compilation of the positive forces of the universe and as the sum total of the strength of all the gods. It was essential as the adversary was the concentration of all that are evil, viz., ferocity, oppression and disease. Mudiyettu has succeeded in presenting both these adversaries in their full glory through well composed flowing movements in unison with awe inspiring performance by percussionists, the like of which can be witnessed only in Kerala. Mudiyettu was considered the ultimate remedy against the most dreaded epidemic, Small Pox. Still, popular belief is strong as is indicated by the rush of devotees wanting the blessing of the actor performing as Kali. Blessing of the entire village by him at the end of the performance is an essential part of the performance. There are few mandatory rituals needed to be performed before Mudiyettu is performed at a venue. These include, Kalamezhuthu and Pattu and Kuruthi (Sacrifice). The former is to please the deity herself whereas the latter is intended for her Bhoothagana (the army of demons). There are many scenes in the performance like the Narada delivering the message to Lord Shiva the stress is on three important scenes namely, (i) Darikan's entry, (ii) Kali's entry and (iii) the fight. Perhaps the earliest existence of comic characters in Theatre can be found in Kooli and Koimpadar. The former, a representative of the demon warriors is a fore-runner of Bheeru in Kathakali, who tries to amuse the audience by crude extempore actions, while the latter relies more on subtle comments following a recognised script and behaves rather like the Vidooshaka of Sanskrit Theatre. However the real duty of these two during the performance is attending to the various chores related to the sequence and assisting the main performers, much like the buffoons of a circus. Facial Make-up and the headgear of Kali are classic examples of our rich tradition in sculpture and other handicrafts. Theeyattu can be considered a by-product of Mudiyettu, though many Theeyattu artists today tend to disagree. However, as indicated by rather well developed Abhinaya (Acting) using Hasthamudras (Hand gestures), Theeyattu is much younger to Mudiyettu, which in the pure form is absolutely without any gestural acting.